If you're visiting the city, Pittsburgh boasts several fine hotels to choose from. And if you already live here, there's one you probably keep coming back to: the William Penn. That would be the Omni William Penn, though the hotel has changed hands numerous times over the decades. Built by industrialist Henry Clay Frick in 1916, it's since been owned by firms including Sheraton, the Westin chain — even Alcoa. When it opened, the William Penn had every amenity a traveler could imagine: "Electric Lights in Bed for Reading, Mantle Clocks Run by One Timepiece," trumpeted the Pittsburgh Gazette-Times. Every room had a telephone, and — even more impressively in an age when hotel rooms often shared bathrooms — a private bath. All for $2.50 a night. A tour of the hotel, the Gazette-Times enthused, "leaves the mind confused and amazed ... at the contemplation of the brain that conceived and executed it all." It was said to be the largest hotel between Chicago and New York. 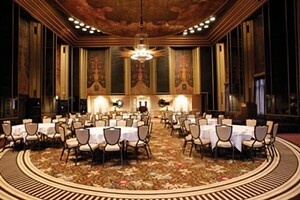 Through good times and bad, the William Penn has retained its luster, hosting luminaries ranging from Theodore Roosevelt to the dignitaries attending the G-20 summit in 2009. (And yes, a few celebrities too.) But it hasn't just been a way station for visitors: It's been a cultural touchstone for natives, too. More serious business is conducted here as well, thanks to its conference facilities, its opulence and its prime location near Grant Street's temples of government and commerce. A visit to the main lobby's Palm Court — especially in the morning — often turns up local politicos and civic leaders, deep in conversation. Evenings offer frequent performances by local jazz combos, centered around a grand piano the hotel bought from Andre Previn. The William Penn has been made and remade a handful of times, and names have come and gone. Gone are one-time destinations like The Chatterbox and the Harp & Crown, replaced by the formal dining of the Terrace Room, and the public-house feel of the Tap Room bar. But the hotel's Gilded Age sophistication remains. To visit in the William Penn, overnight or for a briefer stop, is to be reminded of the Pittsburgh that was ... and maybe to get some clues about the city that may yet be.